Using a ground cover around your plants is more than an aesthetic choice. Sure, it gives your garden a finished look, but also helps the soil retain moisture. Pebbles make a fine ground cover for your garden, but because they're so small, you'll need to take steps to ensure the pebbles stay in place. While it's best to do this before you plant any plants in the garden, you can also add a layer of pebble mulch to an existing garden. If you're using pebbles as a ground cover around your plants, they pebbles act as a mulch cover for the garden. Mulch helps to retain moisture in the soil because it provides a barrier that reduces the rate of evaporation. According to Common Ground Garden Program, which is run by Los Angeles County Master Gardeners, a mulch layer can reduce evaporation by up to 70 percent. While this helps, pebbles don't add nutrients to the soil like organic mulches do. You're also more likely to have to buy pebbles, unless you have a gravelly soil and time to sift it for stones. Wherever you're using pebbles in your garden, you'll need to first dig out the area for them, and put up some kind of barrier. Because they're so small, pebbles can easily get kicked around, or blow around if something isn't acting as a wall to hold them in. Ideally, the pebble ground cover should be between 2 and 3 inches deep. With the area dug, smooth the bottom and the walls with the flat side of a shovel, hoe or trowel. If you have existing plants in the garden, be careful not to disturb their roots. Instead of using a shovel around the plants, use a trowel and dig slowly and carefully, removing just 1 inch of soil around them. Loosen the soil throughout the area where you don't have existing plants. To keep weeds from growing under or between the pebbles -- and to keep the pebbles from working their way into the soil -- lay down a layer of landscaping fabric along the bottom and sides of the bed. If you have existing plants cut the landscaping fabric around the plants. Don't use landscaping plastic, as that will create a moisture barrier that won't allow water to penetrate and reach your plants' roots. Use landscaping staples to hold the landscaping fabric in place. 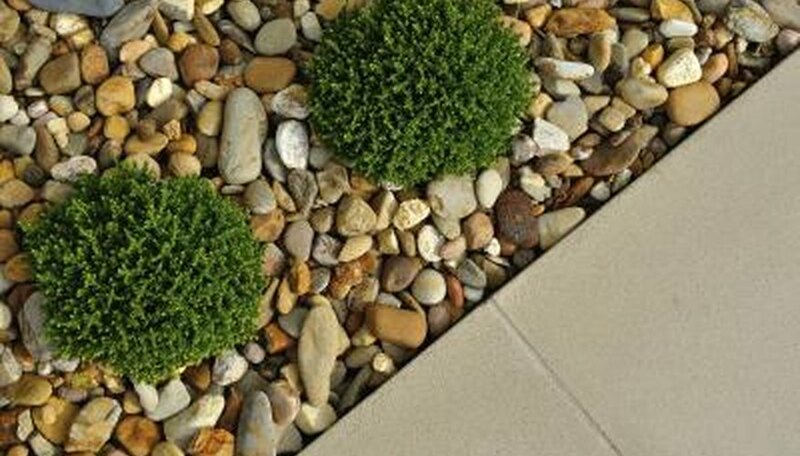 Set edging along the "walls" of your garden, with a lip of the edging rising above the height of your pebbles, to keep the pebbles in place. With all of that in place, spread the pebbles over the bed, sprinkling a thinner, 1-inch layer around the plants and a thicker 2- to 3-inch layer over open garden areas.